Slavkov U Brna, Czech Republic - August 11, 2018: Slavkov-Austerlitz Castle Historical Reenactment. Procession Of Horsemen In The Historical From Napoleon Bonaparte In The Great Court Of The Slavkov-Austerlitz Castle. Lizenzfreie Fotos, Bilder Und Stock Fotografie. Image 114642758. 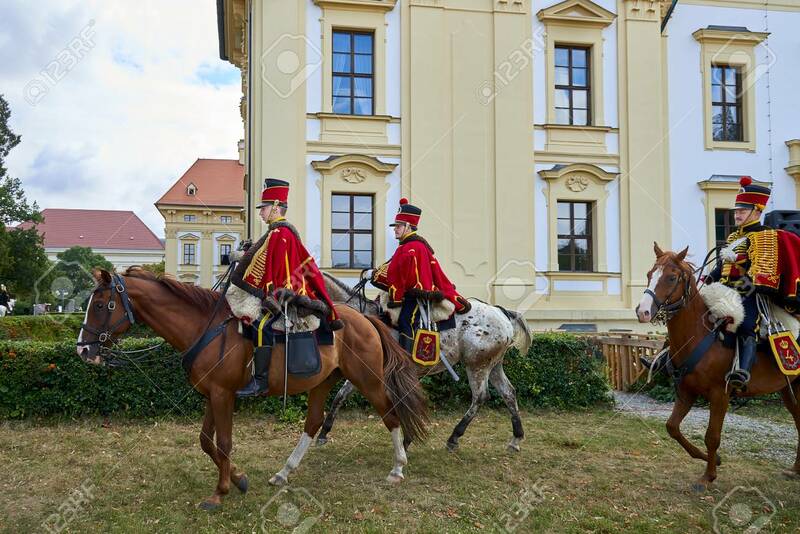 Standard-Bild - Slavkov u Brna, Czech Republic - August 11, 2018: Slavkov-Austerlitz castle historical reenactment. Procession of horsemen in the historical from Napoleon Bonaparte in the great court of the Slavkov-Austerlitz castle. Slavkov u Brna, Czech Republic - August 11, 2018: Slavkov-Austerlitz castle historical reenactment. Procession of horsemen in the historical from Napoleon Bonaparte in the great court of the Slavkov-Austerlitz castle.